A North Dakota State offensive lineman had a subtle way of displaying his political beliefs when visiting the White House on Monday. 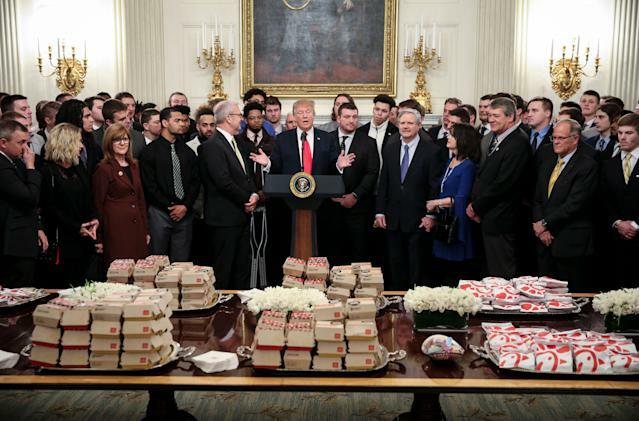 The Bison were invited to the White House for (yet another) fast food feast by President Donald Trump to celebrate the team’s FCS championship game win over Eastern Washington. Offensive lineman Jack Albrecht was one of the players in attendance. And he wore a Democratic Socialists of America pin on his blazer. The display did not go unnoticed by the Red River Valley Democratic Socialists of America. That’s the DSA chapter in Fargo, North Dakota. The RRVDSA highlighted Albrecht’s support on its Facebook page Monday night. Rep. Kelly Armstrong: SoCiAliSm Is NoT fOr NoRtH DaKoTa,” the post read. If you’ve been paying attention to politics at all lately you’ll know that the word “socialism” has been derided by Trump and other members of the Republican Party in opposition to proposals to expand government services like Medicare. The president and others like to use the chaos in Venezuela as an example of the failures of socialism, though the DSA platform is far, far closer to the governmental structures in place in many developed Western European countries. And besides, even if you agree or disagree with Albrecht’s beliefs, you have to respect him for exercising his First Amendment right to free speech and peaceful protest.